Dias Renaissance Guitar — Gamut Music. Inc. In the collection at the Royal College of Music in London there is a fabulous guitar. This instrument was made by Belchior Dias in Lisbon, 1581. 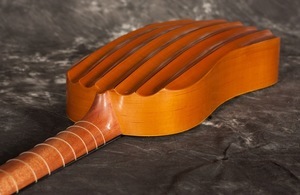 In its current condition it is set up as a guitar with five courses, but the small size of the body and short string length makes it a perfect model for a four course renaissance guitar and this is the configuration which I am currently offering. Our version of the Dias Renaissance guitar has four double courses, (the first course is most commonly strung with a single string these days), with pear wood back and sides and a mahogany neck and head. The front is a AAA Engelmann spruce that is at least twelve years old with a three layer inset rose with two layers of wood over a parchmant background. 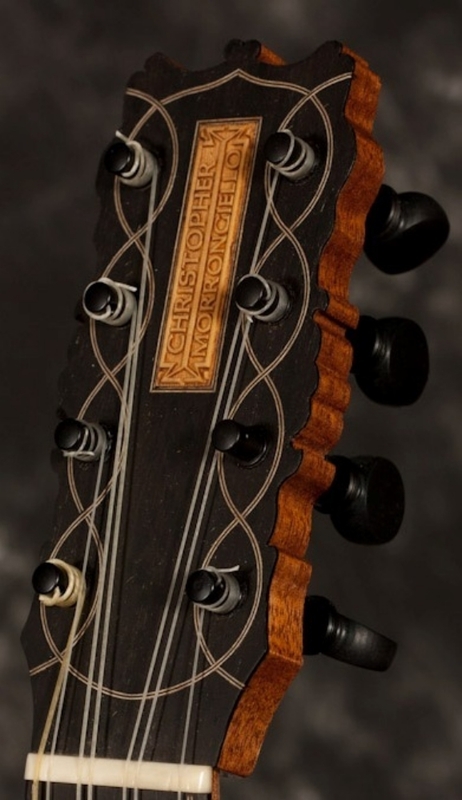 The fingerboard and head plate are ebony along with ebony edge binding around the front. You have a choice of either ebony or boxwood for the pegs as well as an option for mechanical PegHeds, if you would like to use those. The strings that come standard on the instrument are synthetic, nylon, fluorocarbon with a wound nylon G-6 course and there is an option for a set of gut strings. The basic model instrument comes with a good quality engelmann "AAA" quality spruce front. Other varieties of front woods, listed below, are available as an optional feature. Please click on this link to go to the page that explains all of the front woods available.